News just in - Michelle Heaton has been voted off in a surprise eviction. The former Liberty X singer is the fourth contestant to be voted off Celeb BB. Oh dear, bet she thought she was at least going to be in the final three..in her dreams! I think her tears and tantrums soon got on the viewers nerves - plus her whingeing about Coolio's taunts that her and fellow contestant Ben (former A1 boyband singer) had a "thing" was really beginning to drag on. Will be interesting to see who the winner is - can the remaining housemates really put up with Coolio's behaviour much longer?!?! 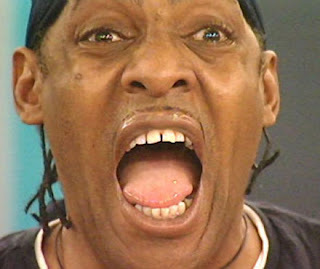 This pic totally sums up how annoying Coolio can be! PS Oh and La Toya to win!